Editor’s note: If you haven’t seen previous seasons of “Game of Thrones,” beware of spoilers ahead. Otherwise, don’t worry — no spoilers about Season 8 appear in this story. In Washington state, like much of the country, Daenerys Targaryen is the most Googled “Game of Thrones” character, hinting that the Mother of Dragons might be America’s favorite choice for the Iron Throne, according to CenturyLink. 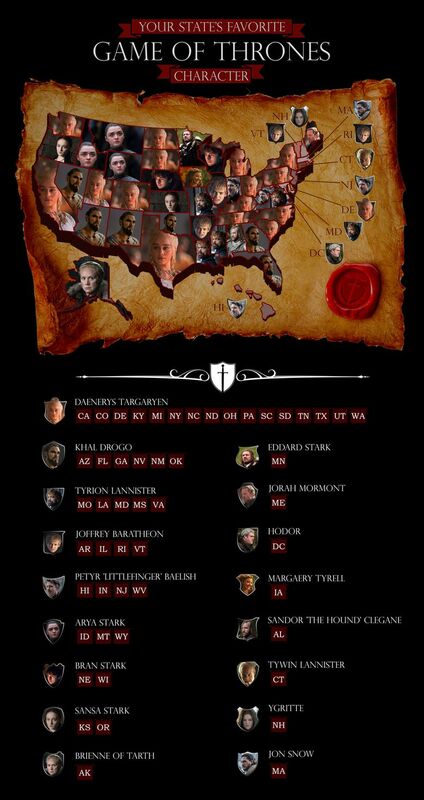 Daenerys nabbed the greatest number of searches in 16 states, the most of any character. Her long-dead husband, Khal Drogo, was tops in six states, making him the second-most searched character in the past five years, according to the internet service-provider’s tally. Drogo’s currency may be tied to actor Jason Momoa’s new role as “Aquaman.” But other characters’ popularity in certain states could have more to do with their personalities. Jon Snow, who it turns out has the strongest claim to the throne, was most searched for only in Massachusetts. House Targaryen is the most oft-searched for house, with House Stark coming in second and House Lannister at the end. Tyrion is the most searched member of the cutthroat lion family, followed by his nephew, the late King Joffrey. The account was compiled using Google Trends’ search volume data to compare the number of searches for 25 of the show’s most well-known characters over the past five years. And if all this sound like Valyrian to you, it’s not too late to binge on “Game of Thrones,” catch up and start rooting for your own favorite.